Here?s an example of how your day can be momentarily ruined in one easy step. Early one bright and breezy morning I cycled to the local bottle bank to dump my jars and bottles. Once nicely smashed I then pedalled out of the car park and rejoined the road. This road is a quiet road at the best of times and at this time in the morning it was empty. I looked left, I looked right and off I spun. About thirty yards from the entrance of the bottle bank car park is a crossroads. I wanted to turn right at the crossroads so I cycled in the middle of my lane, passing the entrance to a small cul-de-sac in which I was briefly aware of a car reversing erratically out of a driveway. The road was still clear ahead. I glanced over my right shoulder. All clear behind too. Then I heard the engine. 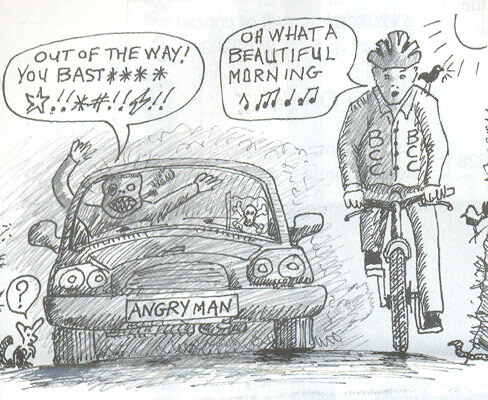 Cartoon taken from The Bristol Cyclist, the magazine for the Bristol Cycling Campaign. When you cycle regularly, you get very attuned to the varying pitches of the various engines of the varied vehicles that veer up from behind. Like wing-mirrors your ears are your eyes in the back of your head. Your ears transmute sounds into instant pictures so though you may be facing forwards and riding into what you see, your brain downloads the sounds into a pretty accurate visual scene of what is unravelling behind. That?s one of the reasons I would never cycle wearing headphones plugged in my lugs. I like to hear what is happening all around. It helps to keep you upright, aware and safe from a biff up the bum. The engine that I heard behind me on this particular morning was impatient and angry, and its sounds sent out immediate warning signals. Without even looking over my shoulder I knew exactly what was happening and what was about to happen. I knew that the erratically reversing car had shot out of the cul-de-sac and was about to try and overtake me, even though I was a mere swinging cat?s length from the crossroads. As I didn?t fancy being overtaken and then cut-up, I quickly glanced behind, caught the driver?s eye, indicated very certainly that I was turning right and moved from the centre of my lane to ride down the centre of the road. The driver didn?t like this at all. He wanted to overtake this obstacle in front of him even though this obstacle was turning right and he wanted to turn left ? all in the space of about ten lengths of bike pump. As I didn?t want to be squashed while an impetuous driver cut across my front wheel, I held my ground and kept him in his place. After all, if this man were to overtake at the same time a vehicle was turning left off the main road into our road, there would be a lovely smashing crash. So in effect, I was doing this driver a favour. What angels us cyclists can be! Unfortunately Mr Honda Civic Man (as that is the motor he was irritably revving) didn?t see it this way. He wanted to get past come what may. And because he was impotent to do so, he did the only thing he could think of to demonstrate his frustration: he gave me a prolonged blast on his horn. By the end of his blast I had stopped at the junction of the crossroads, properly positioned to turn right. But before I made my turn I thought: I?m going to have a little word with him. So the moment Mr Honda un-civil Civic Man came to a sudden halt on my left, I said a very civilized, ?Good morning! Can I help you?? through his open window. He shouted, ?You stupid @&!#$!?! ignorant ?&@#$!!!!!!,? over and over and over again. I was more polite and simply asked him not to try overtaking cyclists when they are trying to turn right when he is trying to turn left. He then revved away in a big erratic huff. I carried on cycling the six miles to my local family-run veg shop, muttering unsavoury words to myself as I went. When I arrived at the shop, the daughter, Mandy, said, ?Hi Jose! How are you!? ?Slowly seething,? I said, ?but apart from that, fine.? Mandy asked what had happened. So, backed up against the wooden shelves of curly kale and purple sprouting broccoli, I related my tale. A customer putting kiwi fruit into a brown paper bag overheard. When I had finished, the customer, an elderly Yorkshire woman with a wicker basket and a pile of silver-grey hair heaped high on her head, said, ?My husband?s just the same, love. He?s a perfectly nice man, but whenever he gets behind the wheel he turns into a completely different person. We have only to drive past a cyclist and he starts effing and blinding at them even though they are doing nothing wrong!? I laughed, had a bit more chat and paid for my veg. As I was leaving Mrs Yorkshire Woman put a hand on my forearm and said, ?You know what you say to men like that, don?t you love?? I said, ?No, you tell me?. ?UP. YOURS!? she said, enunciating each word ever so clearly. ?And you know what else you do?? she said. I said, ?No, please tell me. I?m all ears!? ?You give him the finger. But only one finger, mind, because two fingers would be wasted on him!? I cycled home much happier after that. PPS. I am still rowing single-handedly across the Pacific of my bedroom floor, and I have just arrived in Tahiti. Russian container ship still conked out. PPPS. A very big thank you to all you up and thumbing thumb-uppers who thumbed me up (and down) in my Guestbook department re. boat book versus bike book. Should anyone else feel so moved to give me a good (or even a not so good) thumbing, please see request alongside the cycling high postcard in April 2005 bulletin. PPPPS. Off for a spot of cycle-rowing writing now. Have got a long way to go.